Gautham Reddy '85 earned his A.B. at Harvard University and completed his medical training and residency at George Washington University and Thomas Jefferson University, before returning to his native California. 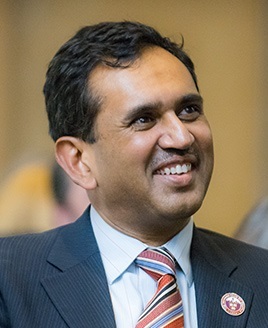 Despite a heavy workload as chief of cardiac and pulmonary imaging and director of the Diagnostic Radiology Residency Program at UC San Francisco, Gautham made time to give back to the local Crimson community through substantial service to the Harvard Club of San Francisco, including one year as Club President (2005-06). Relocating to Seattle, where he serves as a Professor of Radiology, Director of Thoracic Imaging, and Vice Chair for Education at the University of Washington, Gautham continued to selflessly invest in the alumni community, occupying numerous leadership roles in the Harvard Club of Seattle, including Schools & Scholarship Co-Chair, Social Chair, Vice President, and President (2015-17). Throughout his leadership tenure in the Harvard Club of Seattle, Gautham tirelessly stepped up to expand the Club's programmatic offerings, engage new alumni leaders, deepen the Club's commitment to service, and ensure seamless event delivery for the enjoyment of all alumni. Leaving the Club in a strong position at the end of his second term as President, Gautham was invited to - and generously accepted - his current role as HAA Director for the Pacific Northwest, working collaboratively across the region to develop and strength Harvard Clubs and SIGS throughout Alaska, Idaho, Montana, Oregon, and Washington. We thank Gautham for his superb record of service and leadership on behalf of Harvard and our Crimson community! If you are interested in volunteering with the Harvard Club of Seattle, please contact us at club@harvardseattle.org.